The importance of surveillance and security camera systems is constantly growing these days. In the ancient times, there was a camera and a guard whose main task was to stare at the monitor and try not to fall asleep. As technology is developing day-by-day, new technologies arise to help the people who are in need of a reliable security system. One of these new technologies is object detection. Line Detection: What will you need to succeed? Before we start programming, let’s see what devices are needed for this game. One final part is missing now: a camera SDK that you can use for developing your line detecting solution. I found this software, Ozeki’s Camera SDK to be useful, it was easy to work with, and so I can recommend it to you. Another source, Mathworks describes object detection as “the process of finding instances of real-world objects such as faces, bicycles, and buildings in images or videos.” As possible fields of usage, the webpage lists image retrieval, security, surveillance, and automated vehicle parking systems. If we dig deeper in this topic we can find line detection. The basic task of line detection is to indicate if an object on the camera’s image crosses any of the virtual lines we have on our image. You can use this function for security purposes or, for example, to observe costumer traffic in your shop. Fine, now here comes the exciting part of the story. Let’s see how to implement this function. After these basic steps, it is necessary to add the global variables to our code. Here, you will need Webcamera_webCamera. This instance will help us to get the image of the camera. The next variable is MediaConnector_connector. Its task is to connect the mediahandlers. Now, here comes ImageProcesserHandler_imageProcesserHandler. This guy is a mediahandler that runs the instances that implements the IImageProcesser interface. 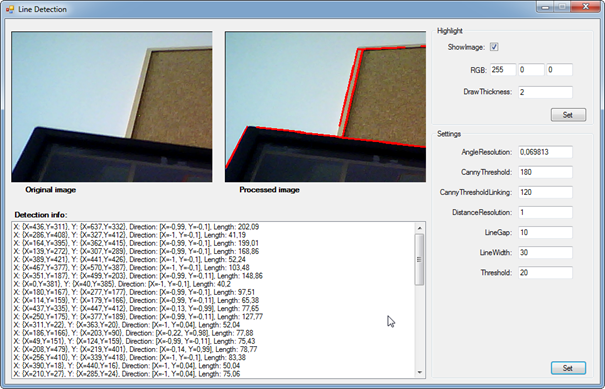 Now we have the interface that is responsible for line detection and that implements the IImageProcesser interface: ILineDetector_lineDetector. Three more variables to go. FrameCapture_frameCapture is another mediahandler. You can configure the frequency of processing with this one. We have the VideoViewerWF instance that is a GUI tool for Windows Forms applications and it will help you to display the video. And last but not least, we have the DrawingImageProvider instance that is also a mediahandler. (Mediahandlers… mediahandlers everywhere.) Its task is to prepare the image, sent by the VideoSender class mediahandlers, for the VideoViewerWF instance. Now we have all the necessary global variables set in our code. Let’s see how it looks like now. We should not forget about the InvokeGUIThread() method. This is the method that handles the GUI thread. It executes the specified method asynchronously on the thread that the control’s underlying handle was created on. If you press the Set button that belongs to the Group Box on the GUI (we’ll talk about it a little later), the following event will be called whose task is to configure the LineDetector. Let’s take a closer look to see what those values in this snippet are responsible for. Let’s start with the two images. On the left side you can see the original image of the camera. The Set button under Settings was mentioned before with which you can configure the basic settings in your program. First, let’s see how to create that almighty Set button. Let’s start with Angle Resolution. Let’s go on with the other group box with of Highlights. And we are done! It was fun, wasn’t it?